There is just something better about doing things the old fashioned way sometimes, don’t you think? While I love trying new recipes, new technology, and new experiences, I also love teaching my kids about simple things too. My kids and I spend a lot of time in the kitchen, baking away and creating new things. The other day I thought it would be fun to teach them something old instead of something new. All three of us put on our aprons, grabbed a few simple ingredients from the pantry, and got to work baking old fashioned biscuits for dinner. Aren’t the simple ingredients great? You can find buttermilk near the milk at your grocery store. Once the dry ingredients are mixed well, add in the butter and buttermilk. I like to use the dough attachment on my KitchenAid mixer. I like to place parchment paper on my workspace because it prevents the dough from sticking. Using a rolling pin, roll out the dough to your desired thickness. Keep in mind that, like all biscuits, these will rise in the oven. We roll our dough out about 1/2? thick. Here’s the really fun part for kids. This is something my mom taught me how to do and I remember it like it was yesterday! Take a cup (a regular old glass) and use the top of the cup as a cookie cutter on your rolled out dough. Placed the round biscuits on a greased sheet and sprinkle some additional salt on top (optional). Cook them at 400 degrees for about 10 minutes or until they start to appear golden. Lucky for all of us, baking these biscuits is very easy which is why I really encourage you to get your kids involved. This is a hard recipe to mess up, which makes it perfect for the busy hands of kids! Serve them warm with dinner! 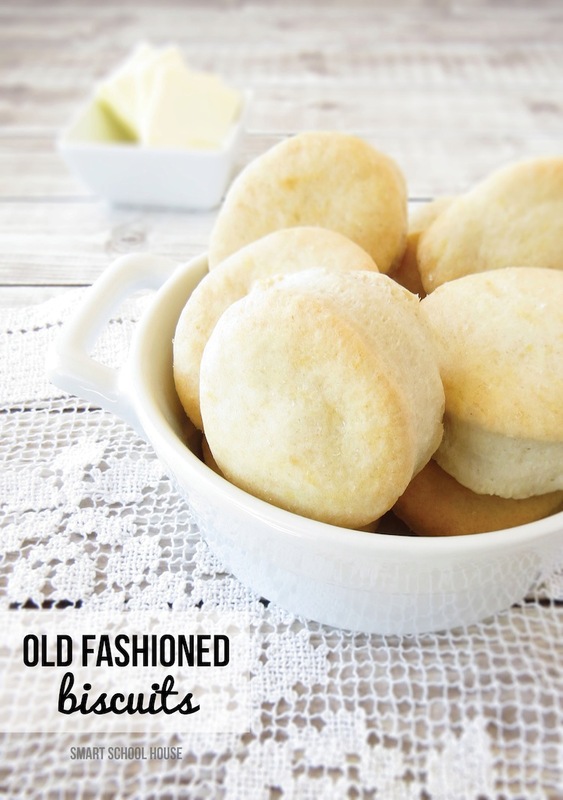 There’s something mouthwatering about freshly baked warm biscuits. The lace tablecloth you see in these photos actually belonged to my mom. I remember her setting the table with this exact table cloth so many times. Now that she’s gone, I felt like it was the perfect time to bring out her tablecloth while the kids and I nibbled on warm biscuits, just like she and I used to do! A very nice tribute to you mother. Reminded me of mine. 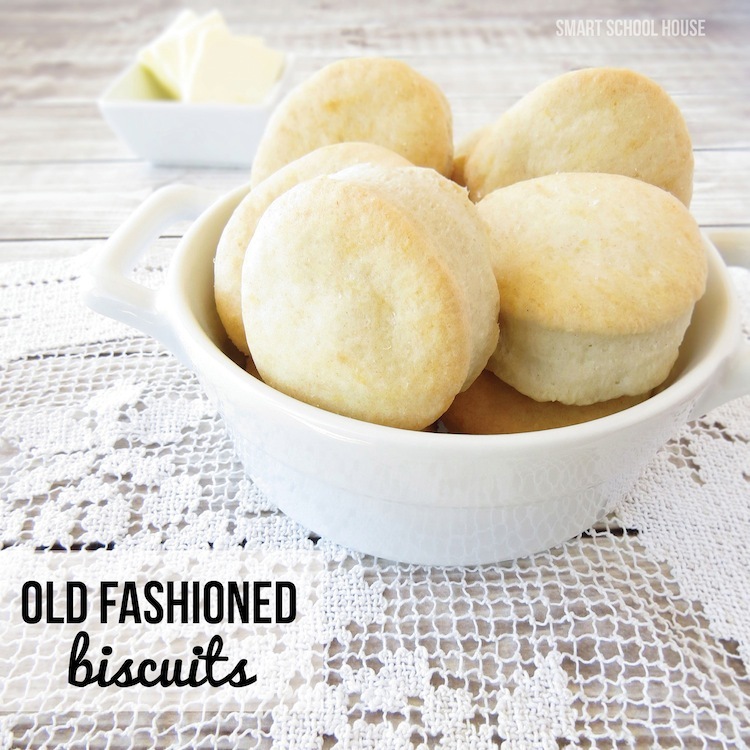 LOVE homemade biscuits. These are gorgeous! could the bisquits be made with almond milk? My daughter can not have regular milk or soy milk. I would love to make these since they are cheaper then buying baking mix. I’m actually not sure! But, I think it’s worth a try! I am lactose intolerant and I usually swap out the liquid in recipes for rice milk, almond, oat milk, or half water and half something else if I am not 100% sure of the taste. Do these freeze well? Have you tried that and do you thaw them out beore baking them? I’ve actually never tried that Bonnie! Tx, looks like fun! What is the rising agent in this recipe since theres no baking powder only baking soda. These biscuits look wonderful! 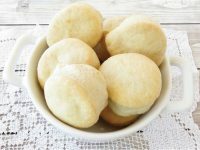 Approximately how many biscuits does this recipe make? Thank you for sharing this recipe. I can’t wait to bake these with my daughters.